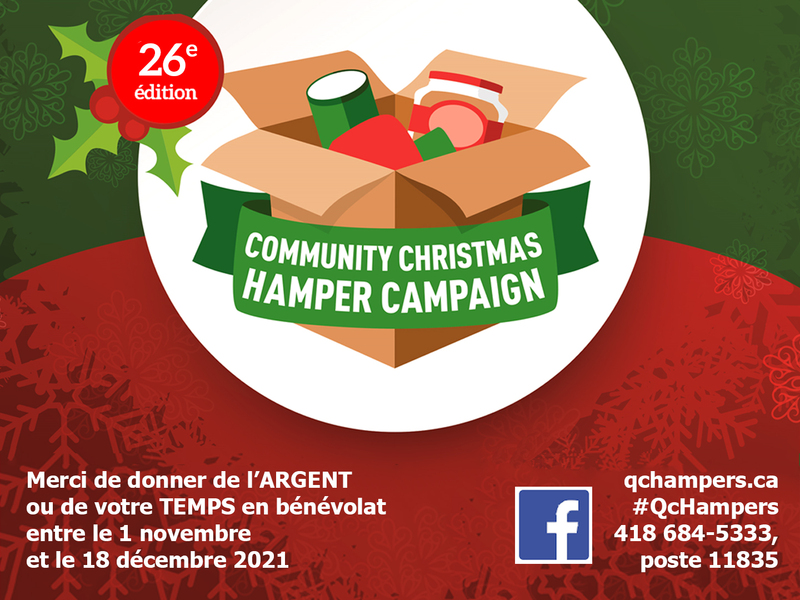 For 23 years now, Quebec City's English-speaking community has been collaborating towards the success of a Community Christmas Hamper Campaign. We distribute over 200 Christmas hampers to homes in need in the Quebec City region, which is an enormous challenge with a most heart-warming outcome. Learn more in the press release, infographic or video. Jeffery Hale Community Partners coordinates the campaign's central registry of English-speaking community members who need help during the holiday season. Join our efforts from November 18 to December 15, 2018! Help deliver some goodness, give to the campaign in any or all of these ways: by offering your volunteer time, by donating non-perishable food, or by making a monetary donation. See Partners section below for other printable and shareable publicity tools. Thanks so much for helping deliver some goodness! The mission of the Jeffery Hale Community Partners is to promote and contribute to the health and well-being of the English-speaking population of the Quebec City and Chaudière-Appalaches regions. Jeffery Hale Community Partners (JHCP) is a registered charity through Canada Revenue Agency (CRA) since 1991 and a leading partner in the coordination of the Community Christmas Hamper Campaign. Donations are managed directly by the JHCP and through Canada Helps. Donations are gratefully accepted to buy fresh produce for the hampers - such perishables as fruit, vegetables, flour and meats to complement the non-perishable food donations. Our biggest purchases are bread, eggs and turkey, which complete a traditional holiday dinner. Great! You can donate to our campaign online by visiting CanadaHelps.org through our charity Jeffery Hale Community Partners and receive a tax receipt immediately. Fantastic! You may submit a donation by cheque payable to the Community Christmas Hamper Campaign. Tax receipts will be issued for donations of $20 or more. The campaign for collecting non-perishable food begins on Sunday, November 18 and wraps up the year on Sunday, December 9, 2018. Please consult our wishlist pdf to your right. All of these items and more are gratefully accepted! Rules and regulations set by the ministère de l'Agriculture, des Pêcheries et de l'Alimentation du Québec (MAPAQ) are set in place for the health and safety of those we feed. In this case, the recipients are the most vulnerable within our community. Therefore our expiry date policy states that homemade items or foods with expired best-before dates are not accepted. Thank you for understanding and respecting this important safety rule. Drop off your food items at any of the following collection sites in your area. A hamper collection box should be found near the entry and identified by a poster with our logo. If you are having trouble seeing the map above simply click here! Did you volunteer with us in 2018? Please share your feedback & click here! I’d like to give my time! Over 300 volunteers work together to collect, pack and deliver hampers on the week prior to the Christmas Holidays. Help deliver some goodness! - Would you like to be contacted next year to volunteer? You can fill in an application here. For assistance on how to fill out the application form, please view our how-to video! - Returning volunteer? Using your username and password, simply login here. Anyone in need of a hamper may register by contacting a church, organization or institution listed in the hamper registry pamphlet between November 11 and 9:00 a.m. on Monday, November 19, 2018. This is a confidential service. Your contact person will give your name and address confidentially to the central registry for the Community Christmas Hamper Campaign. After this is done, names and addresses will be checked for duplication. Your contact person will call you to tell you the date and the approximate time of delivery. We would ask that you make a point of being at home to receive your hamper. It will be delivered to you by a team of volunteers. What are other helpful resources available to me? If you need further help, there are many community services that may be of help to you, including: referrals to other helping agencies (food banks), help with income tax returns, access to a free job bank. at 418 684-5333, ext. 1580. Help! I don't know how to cook a turkey! Please read our instructions on how to cook a turkey safely. How can I attend or promote fundraising events? I'd like to host my own event to raise funds! Would you like to help us fundraise with a special event in your circles? Please contact us (give@qchampers.ca ) and let us know so we can share our resources and put our official logo on your event! Share Your Fundraising Event With Us! Are you affiliated with an organization, church or community group? Are you an entrepreneur or independent business owner? Do you work for a local or international company? Your company, organization or group can help us reach our objective of providing a Christmas dinner to over 200 families this holiday season. Join our committee, raise funds and become a collection site! Printable and shareable publicity tools for our collection sites: 8-1/2 x11 poster in English and French, and 1440x1080 jpeg for electronic display in English and French. Join us as a corporate partner and donate or offer a whopping discount on your food item or supplies. Join us as a corporate partner for our delivery day, or lend your company or organization’s expertise in any way. Interested? Call or e-mail (give@qchampers.ca ) to submit your name and contact information along with your interest in partnering with us. 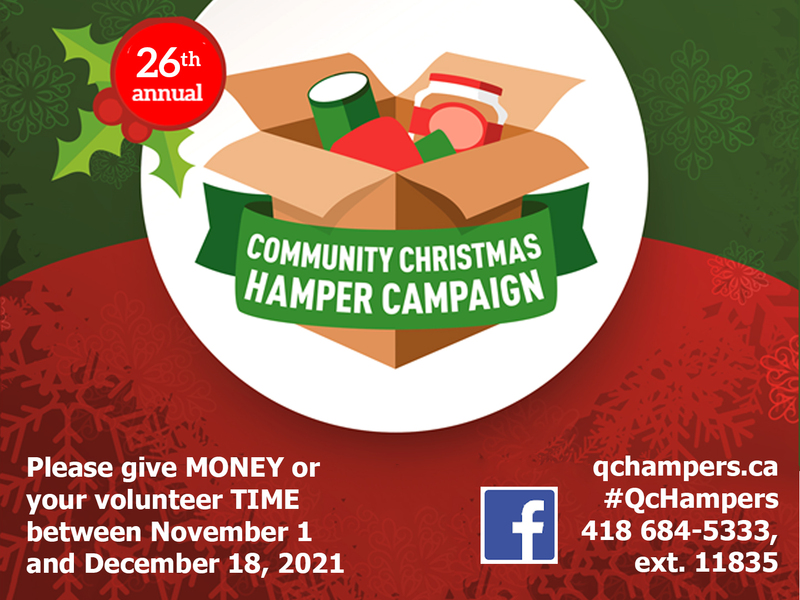 When you call the Community Christmas Hamper Campaign headquarters, please mention whether you are calling to register to receive, volunteer, partner or donate. Join our online community on Facebook!